I have known Greg for over 15 years, and have worked with him on several businesses. I was one of the first investors on board, because I know how smart he is! True to form, I have more than doubled my money since investing about 10 years ago. I get monthly reports on the growth of the fund and can communicate by phone or email with Greg or Steve about my investment. They have the highest integrity and run their funds with complete visibility. I highly recommend investing in Hughes Capital’s funds. It’s the best investment decision I have ever made. I have land, I have real estate, I have some money in the stock market, and I recently invested in your buy and hold fund. And what I really like about it is that you’ve found a niche that is too small for the big players to really want to look at. It’s a really necessary niche in which you are allowing people a pathway to homeownership, which is the American Dream. And you’ve done it in such a way that it is a very fair way… they pay a little bit of a premium, but they are higher-risk type people, but you secure it with real property and so you’re kind of securing your position and you’re protecting your investors by doing that. You’ve created a real win-win in my opinion where you’re really helping the economy, you’re helping people. I believe in what you are doing. I think it is a very clever and smart thing you’ve created. And so that is why I’ve invested in it [Guardian] and I’ll probably continue to put more money in as time goes on. You get reasonable returns, and you know, as an investor I’m looking for risk (How much risk do I have? What are my returns?) and liquidity, quite frankly. Things come up in life. You might have big bills that come out of left field and all of the sudden money that you had invested you need to pull out of investments and if it’s not a liquid investment and you have to sell it immediately, you’ll take a [loss] on it…. You’ve really thought it out quite well and I applaud you for that. I think it’s going to be very successful. I want to thank Greg for the great returns on my investment. I have known Greg Hughes for 30 plus years and I have always watched him perform with integrity, which is why I trust him with my money. I never look for a killing on my money but a nice return with what I consider low risk. So far, so good – in fact, better! Thanks for the opportunity to take advantage of this once in a lifetime market. Greg seems to have knack at finding the great real estate deals. At 55 years of age, I have spent a good deal of my life doing the typical investing: the routine 401K, standard retirement plans, and of course the volatile stock market. As with anybody interested in seeing their money grow, parking it in the bank was no longer an option, since bank interest has become a joke for what seems like an eternity now. I needed something a little more aggressive, but wanted to invest in an area where I had some knowledge, and that was real estate. Having a business to run, I just didn’t have time to research the buying and selling of homes. That is when a friend told me about Hughes Capital. Since they specialize in the buying of distressed homes, I figured, “let them do the work that I don’t have time to research.” I started with Hughes about a year ago. They are a good group of people who send out a monthly newsletter that keeps you abreast of what they are doing with your money. There is no nonsense, no hype. They just tell you like it is — what went right and what may have gone wrong, over the prior month. I opted for the monthly distribution of my earnings, and the funds have showed up like clockwork from the very first month. When you have any questions, unlike most of society today, these folks return your phone calls. If you’re looking for a place to invest your hard-earned money, I recommend Hughes Capital. After only a few minutes of listening to Greg and Steve share their approach to investing in Real Estate, I wanted to be part of what they were doing, so I immediately committed to investing $200,000 in their fund. After having spent more than 50 years in Real Estate, I quickly recognized this as a great win-win investment. 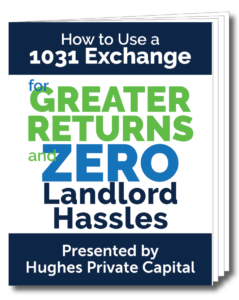 I read Excess Returns, Greg’s book on Rent to Owns, which I shared with my sons and others because he really lays out his investment program in a simple to understand way. I enjoy the weekly blogs that Greg writes, and my investment has gone just as the boys said it would. I have nothing but respect and love for what Hughes has been able to offer and provide for the many folks out there who need alternative financing for purchasing a home. Now they have the ability to get into well-deserved homes so they can either start their lives or get their lives back on track. You have also been able to open up great opportunities for investors like me who do not conform to traditional investing. I have grown very fond of your team and appreciate your true professionalism and transparency — something you don’t see very often in the world of traditional investing. I applaud Greg and Steve for doing business in such a personable way. That is something you just can’t get from Wall Street. They’re available by phone or email and constantly give me updates and reports so I am never left in the dark. I have access to any information I want so that I feel comfortable with my investments. After having had a frustrating experience with a fund manager I was never able to get ahold of, I fully appreciate the hard work Greg and Steve put into communicating with their investors. I look forward to watching my investment grow with Hughes Capital. I met Greg Hughes over fourteen years ago when we were on the Reno Junior Achievement Board of Directors. In 2011, I made my first of a number of investments with Hughes Private Capital, and more recently my business partner and I provided capital for business expansion. I am pleased that several of my investments have matured and have done well. In addition to a solid financial return, Greg’s company has always operated in a very professional manner. Reports are timely and payments are always made when due. We have known Greg and Steve since 2012. We began investing with them in 2016 and have since invested in every fund. Over the past year, we have gotten to know the rest of the team as well and have nothing but great things to say. Communication is the key to a long-lasting relationship and the team at Hughes Private Capital always does what they say they are going to do. We are quite happy with our returns and look forward to continuing our fruitful partnership with the Hughes Team. These guys know what they’re doing! I trust Hughes Capital implicitly to manage my investments. They seem to have a knack for finding and capitalizing on niche investment markets, plus they have clear strategies that really make sense to me. That’s refreshing. 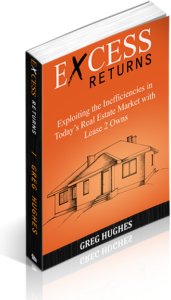 We’ll mail you a free autographed copy of “Excess Returns,” which is the blueprint for our Rent to Own Strategy.